Little Lovely Leaders: Weekend Freebie! I can't wait to share this FREEBIE with you all !! I have taught fifth grade for going on three years. The first year, I was a self-contained room in Alabama. When I moved to South Carolina, I became a Science and Math teacher. Now that we are going to a three-team switch, I am a Math teacher. I have tons a super cute Science stuff, as well as things still left from my self-contained room. Some of those items just DONT GO in a Math-only room...I needed to think of something! Problem solved! 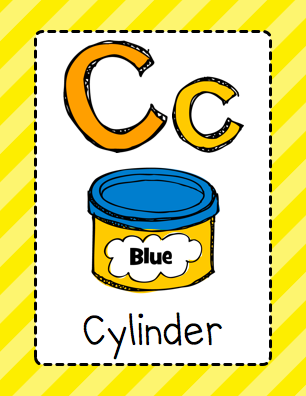 Yesterday I created a poster set with all Math-related terms and ideas. I am really thrilled about it! 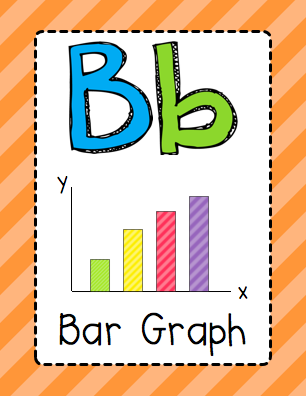 This will be a super cute addition to my Math room; as well as a great source of color over the white board! I really think the kids will get a kick out of the graphics, too! I hope you all can find use for these, as well !! Click HERE for this freebie! Awesome and adorable! You are so crafty! Thanks guys!!! I am so glad you like them! I can't wait to see what they look like when they are hung up in my room! I love these! These will go over my math bulletin board. I already have a cursive alphabet up but this ties into math beautifully. I'm a new follower! :) Thanks for sharing! These are too cute! I am your newest follower. 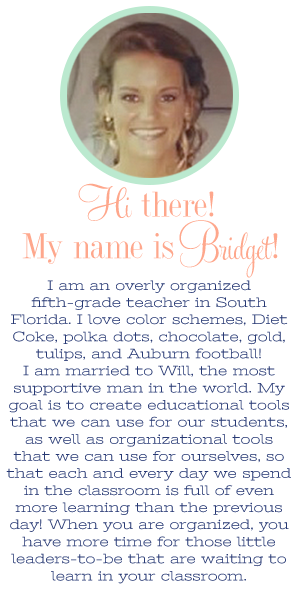 Stop by mysecondgradejournal.blogspot.com to check out my blog. Thank you so much for this freebie! I'm always looking for math things to hang in my classroom. This is perfect! What a great idea! This will be a great addition to my classroom! Thank you so much! These are wonderful and I can't wait to put them up, the kids will love them! Very generous of you :o) I'm your newest follower! It's always nice to find another 5th grade teacher out here in blogland. Come check me out if you get a chance! Math teachers everywhere are LOVING you! This is awesome. Thanks so much for sharing. 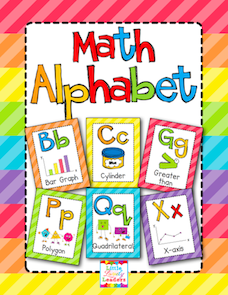 It is a great link for math and literacy! Can't wait to show my students in my classroom. These are absolutely wonderful! Thanks so much for your generousity!!! Math posters are such a great idea. Thanks for sharing. Just found your blog and am a new follower. This is awesome Bridget! Thanks for sharing! Thank you SO much for sharing this! I am getting it printed at Staples to hang in my 6th grade math room :) I really appreciate it!! Thanks for the great freebie!I am a first grade teacher right outside of Charleston. Welcome to the Palmetto State! These are fantastic!! You are the BEST to share it with us!!! Hi Bridget! This is awesome, I just blogged about it on my blog! I can't wait to use it this year, thanks for sharing! I also teach fifth grade! Check out my blog too! I love your graphics! What program do you use to make them? Absolutely LOVE this! What a great way make a classroom language and math rich! Just wish it was in cursive, also, for intermediate. THANKS! What a greatidea. Thank you. This is AMAZING!! LOVE, LOVE, LOVE! So glad I found you off Pinterest. I'm a new follower and now a HUGE FAN! Bridget, I LOVE these. I was teaching a senior class in primary school last year and I wish I had these in my room!! I'd love if you could add a link to this post in my FREEBIE classroom décor linky party. These are amazing. What a great idea. This is awesome! Thank you so much for sharing!! I am your newest follower and wanted to thank you for this wonderful freebie! It is so perfect for my classroom and so different from the typical cursive letters above the wall. Not to mention, it adds a ton of color to my room! I love this idea! So adorable!! These are fantastic! I can't wait to laminate and post in my room! Thank you for such a generous freebie! I am a new follower. Love these! Shared them with my co- workers who teach in the higher grades! Thanks so much!!!!!!! I was wondering if these are still freebies? It's posted here as a freebie and under your "freebie" link as well, but it says there's a cost of 2.50? Gotta Love a Shout Out! Product Swap - Glyph Monsterrrr!